During the 1990s, Dennis Green had the most successful record in the National Football League. He is, indeed, one of the most successful coaches in NFL history whether white or black, and has achieved what few coaches have achieved. Through the 90s, he had the 9th best winning record in NFL history and held the best winning percentage of NFL active coaches. 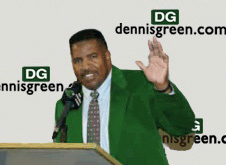 Dennis Green has the highest winning percentage in the Vikings 40 year history. The 15-1 1998 season was the second best in NFL history. The underlying theme of Green's teams has been perseverance, no excuses, and a drive to win. Green's motto is: "Plan your work and work your plan." He explains how to do so with what he calls “The 3 Ds:” Desire (goals), Dedication (work ethic to achieve the goals), and Determination (perseverance). In his autobiography, No Room For Crybabies, he tells his inspirational life story, and provides the blue print for and explanation of how he overcame bigotry and discrimination to succeed in life and to climb to the top of his profession. He grew up in the inner city of Harrisburg, PA. He lost his parents when his dad and then mother died when he was 11 and 13. He was a star halfback with the University of Iowa Hawkeyes, and participated in athlete black power anti-segregation/anti-prejudice stands. Prior to the NFL, Dennis Green turned around the losing college programs of Northwestern and Stanford. He has devoted part of every summer to camps for kids from the inner city. During every season, every Tuesday was "community day," in which Coach Green and his players worked in the community at schools and boys and girls clubs, churches, and other settings, helping to give back to the community what the community had given to them. He has given generously of his time and money to many charities and community organizations. He was given the World Sports Humanitarian of the Year award in recognition of his efforts. He was rated in a magazine profile as having the work ethic and managements skills that qualify him to be the CEO of any company.